Der Orangenbaum. Concert installation at Projektraum Bucher, Vienna - May 03. 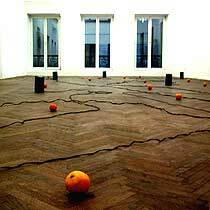 The installation project 'Der Orangenbaum' (German for ''Orange Tree') was originally conceived as a public space sound installation at Praterstrasse, one of the main streets of Vienna's second district, being part of the art project 'Taste 0-20'. Orange-coloured round loudspeakers were to be installed in several trees on both sides of the street. Various sound recordings of bird songs were modified and arranged as an 8-channel-sound installlation. Unfortunately, the funding of 'Taste 0-20' turned out to be insufficient, thus the basic idea had to be adapted and 'Der Orangenbaum' was turned into a concert installation performed by Bernhard Gál on powerbook computer at Projektraum Viktor Bucher, a gallery located at Praterstrasse.